I had such a great response on the first giveaway, let’s do another one! One (1) 50-page hardcover 10 x 8 portrait book (called the “Santa Fe”) with protective UV coating (a prize worth approx $100.00!) 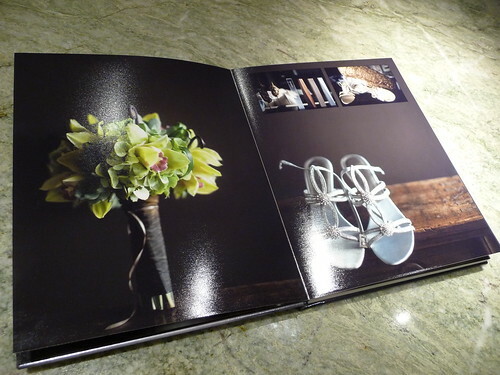 – the same style and size of my wedding album! 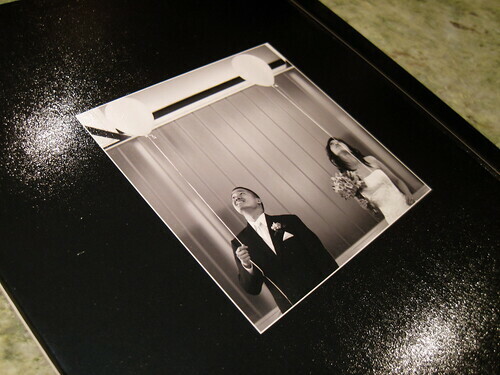 AdoramaPix photo books are printed on real photo paper with super thick pages that lay flat. The pages are so thick I made a video for my review to give you a better idea of the quality (see video below) – these are not typical photo book pages! The spreads are made up of a single page that folds in the center – so you don’t lose any of your image in the middle. It is a stunning book and I get lots of compliments on mine. Your book will also feature the protective UV coating option (a $25 dollar value in itself!). The coating helps protect your pages from scratching and fading over time. Check out my review of my AdoramaPix DIY wedding photo book. See what kind of fun themes are available for your book at the AdoramaPix website! You have 7 possible ways to enter. The first one is REQUIRED and the rest are optional. For EACH additional entry to count, you have to COMMENT ON THIS POST below with a separate comment for EACH entry, telling me what type of entry you did. But make sure to do the REQUIRED ENTRY first! This giveaway is open to U.S. residents only, 18 or older. Void where prohibited. Entries must be received by 11/18/2010 at 11:59pm CST and any entries not in accordance with the rules will be disqualified at our sole discretion. Winning entry will be chosen using Random.org. I will announce the winner thereafter and will email the winner. The winner will have 48 hours to respond or I will redraw another entry. Disclosure. Winner only pays for shipping – U.S. Mail is $4.99 and UPS 2nd day air $12.95. A huge thank you to AdoramaPix for providing this giveaway prize! b/t/w – AdoramaPix just posted a 10% off promo on all their books (the 8×8 book is still 20% off). Click here for the latest on AdoramaPix and a link to AdoramaPix deals. I would definitely make a wedding book. Your adorama book looks great! You’re right this is the giveaway I’ve been waiting for!! I already like you on facebook (name Ivan Rivera). I would probably make my own wedding photobook if I were to win! I already like Adorama Pix on facebook as well. I subscribe to your blog via the newsletter. That’s 4 entries for me woo-hoo! Oh! I would so use this for our wedding! We are getting married next month in the Riviera Maya. I already made a wedding book for my parents, thanks to finding out about adoramapix through your blog! I would make a book of our Hawaiian honeymoon! I am a facebook fan! Hayley Schuster! Also liked you and adoramapix on facebook (Carla Siler) and followed both you and adoramapix on twitter along with retweeting. I will also plan to make a wedding album with AdoramaPix! I would make with my AdoramaPix book for wedding if I won. Doh! I just saw you had to do a seperate entry for each thing. So Here is the one for following adoramapix on facebook. I would use it to make the wedding book for my niece that I promised her. I already subscribe to your blog and I read it, which is why I knew to come and enter!! I would make a photo book on my first ten years of marriage to my husband. We have been to 40 countries together, so far. I have lots to document. I am so excited about this giveaway! I just got my first book from AdoramaPix and I really was impressed. I made a best-of-2010 portfolio for my photography business and I think I’m going to use AdoramaPix from now on for my clients’ photobook albums! For the giveaway I would like to make a book all about my time in Grand Teton National Park when I used to work there as a Park Ranger. I have tons of digital images, but it would be cool to have a nice book documenting it all. I just became a fan of AdoramaPix on Facebook (fb name “Sarah Hall”). I commented on your post reviewing your AdoramaPix lay-flat wedding book! I commented on your post comparing Blurb & Mpix. I commented on the Photobook America Layout post. I really liked it. Lots of good info. Oh wow great giveaway! I have been wanting to make an Adoramapix book ever since I found you and your blog (on photo-on-the-net). I had some “trash the dress” photos done and would definitely them to make my book!!! I “like” you on facebook already!!! Whoops didn’t see the separate entry part. So this is my comment for the newsletter to which I subscribe to. I commented on your “lay flat adoramapix book” post – the one where you made your wedding album! LOVE IT! I use it to make a 2nd wedding book to give to parents. Oh! I’d do my honeymoon photos! I liked you and AdormaPix on FB and am a confirmed subscriber of your blog. I would make a travel/vacation book. We have so many pictures waiting to be printed in beautiful books like these. I just signed up for the RSS feed of your blog. I think I signed up for a newsletter before, but never got the confirmation email. I already “like” AdoramaPix on Facebook. I already like you on FB. Name – Mary Wong. Like Adoramapix on FB. Name – Mary Wong. I would make a vacation book with all the incredible pictures my husband and I have from our ten weeks in Asia – Thailand, Vietnam, Cambodia, Burma, Laos, and Malaysia. This was the trip we did before becoming a family, and I still haven’t ever made a book with all the photographs! I would make a book of family photos. I commented on your DIY blog post on engagement photos – http://www.photobookgirl.com/blog/diy-wedding-photo-ideas-creative-tips-engagement-photos/comment-page-1/#comment-1390. My name is Claudia Alaniz. Thanks! I have also subscribed to your blog, thanks! Here’s my 6th entry. I commented on your Picaboo X review – http://www.photobookgirl.com/blog/my-picaboo-x-review-madison-lay-flat-photo-book/comment-page-1/#comment-1395 . I have a Picaboo Groupon I am waiting to use and this review was very helpful. Thanks! I would love to make a vacation book from AdormaPix. I have used them for some prints in the past. I also have bought a camera from Adorma. I would make an album for the last vacation to Vegas. Subscribed to your blog and confirmed. I would make a book using my collection of ride photos of The Blue Ridge Parkway area (SC, NC and GA mountains). I have read all of PhotoGirl’s advice, use it and pass her links on to my friends and family. Wow, that book is absolutely stunning. If I won, I would make that book into my son’s long awaited baby book. I haven’t had time to scrapbook, and have been waiting to find a book that had the quality that this one seems to have! awesome. I would use it for a photobook of my daughter. I would love to make an Adoramapix wedding album. I just became a fan of Adoramapix on Facebook. (Nikki Smith) Mahalo! I would use the album for our wedding pictures! I just subsribed to your blog and confirmed! I became a fan of adoramapix on FB. i would like to do a honeymoon book. once we completely take our honeymoon. I would make a wedding book to display in our home. I posted a comment on your PhotoBook America software review. I would make a wedding album. We got married this past April in Tahiti (with a follow up ceramony in the US to make it legal) and so we didn’t have the option to have a professional book. So I have been doing a ton of research on making our own. Thank you so much for all the tips and reviews!! Forgot to mention I am already a fan on facebook as well! thanks again for all the great info! My mom misplaced the original Mypublisher wedding album I made her a few years ago, so I’d love to make her a new one! I’d make a wedding book, since I still don’t have one! So hard to decide — either my newborn or a wedding book (because two years later mine still hasn’t been made). I would make a family book. My Dad died three years ago and I want to make a photo book of happy images from his lifetime for my stepmom. I’ve never tried Adorama’s book services though I’ve shopped at the store and this week I’m ordering prints. I fully expect it to be very high quality. They have great customer service. I am hoping to make a wedding album for my beautiful daughter-in-law. They have been married for two years and had two weddings – the first in the U.S., the 2nd in Australia where both she and I are from. The bride and groom were the same but the attendants were different and the photographers were exceptional. An adoption lifebook for my daughters. Retweeted today Nov 14, 2010. I would make a family photo Book – just because I love my family so much<3 I feel blessed that I have my two beautiful kids and my loving husband! commented on Q&A: Top Tips for Making Great Photo Book Templates and Layouts – My Photobook America Preview – great article! If I won the book I would make a family history book. I found 39 letters my father wrote in the late 40’s, to his sister while he was in the navy. He was 18 to 22 years of age when he wrote the letters, I am transcribing the letters and will scan some of the actual letters. I plan on using some of the pictures I have found, and look on the internet for others of the places he talks about. Plus I have some hankerchiefs he bought his sister which I plan on taking pictures of to add to the book. I plan on sharing this book with my brothers and sister and an Aunt he was very close with. I’d love to have a book made of the engagement photos taken by a great friend of me and my fiance. I’d like to possibly use it as a guest book at our April wedding. I follow you on Facebook — my name is Melanie Horton. I followed AdoramaPix on Facebook — my name is Melanie Horton. I subscribe to your newsletter — my name is Melanie Horton. Your book is gorgeous! I’d make a wedding book as well. I would be making our yearly family album. I follow you on facebook! My name is Misty Lundin. I would make a Photo Book of the cruise my friend and I took earlier this fall. I would make a book for my boyfriend with photos of all our fun times together! I think I’d make a portfolio of some of my photography work. Thanks for the giveaway! I’d make our wedding photobook. I would create a wedding photo book. for one of the most amazing newlywed couples I know. They are the classic low income just trying to get ahead newlyweds. They make such a fantastic couple. They deserve to show the world just how wonderful they are together. i think i would make a vacation book… we have one for our wedding and LOVE it. I would make a vacation book from photos taken during last summer’s family vacation to the Olympic Rain Forest. I have subscribed to your newsletter using the name John S.
it would be a toss up between my wedding and my baby. I’d make a “Don’t Get Homesick” book for my sister because she is going to be moving soon to South Africa for at least 3 years to study Great White Sharks and though we’ll visit her a few times while she is over, I know she’ll get homesick and when she does she can take out the book and feel better. I would love to make a wedding album with the AdoramaPix book. I would make a book chronicling my daughter’s seventh year. A dear friend just took hundreds of pictures of us/her and I’d love a special book of these images to treasure. I would make a wedding album for sure. Commented on layout tips post. Getting ready to take family photos in San Francisco this weekend and plan to make a family photo album. I would like to do a family history book–kind of like a family tree in book form. I’d want it to be something we could pass on to our kids–and it seems the uber great quality. I would love to make a baby book. Last entry, I’m crossing my fingers! I can learn SO much from you!! Really … I could be doing so much more with my photos and books! Awesome — I’d use this to make a wedding album for my parents. If I won I would make a wedding photobook. We got married in August and our photographer gave us all HD photos in lieu of a photo album. I’ve been ogling your AdoramaPix album and would love to make one myself! I subscribed to you via Google Reader. I would make a wedding photobook, finally after 3 years! I “like” you on my facebook page (Chantelle). I would love to make a baby book for my newest addition! I posted a comment on the Q&A:How to create customizable layouts in blurb. Sorry it’s so long. I’d use this to make a wedding album! I’m also a fan of you on facebook. I would build the ultimate travel book for my study abroad trip during college. I would either make my brother a wedding album if he wanted one or I would make a family and friends book highlighting the past few years. I would make a book of our best family vacation to date (in ten years) when we spent a blissful 3 weeks relaxing in Navarre Beach Florida with our three boys, weathered out the influx of a hurricane into the gulf (massive waves & shells on the beach) and then the subsequent calm (and of course, thousands of pictures). Liked Adorama Camera on FB – Ashley Augustine! I would definitely make a book about my concert adventures with NKOTB! I would make a vacation album. 🙂 I am already a fan of yours on Facebook (full name in email address). I just booked my 2nd wedding to be held in June and I would love to make a guest signing album to showcase the engagement session. It would be good publicity for me as well as an unexpected goodwill gift to the happy couple! If I won I would make a book documenting the wonderful summer we had in our new cabin. I would do my wedding album! I subscribed to you via RSS feed! I’m following you and adoramapix on twitter and tweeted about this giveaway! I would make a baby book for my 10 week old son… it would be stunning as he is the most beautiful thing in the world!! On FB I am Sarah Wineroth Plants. I love your site and I looove what you do! Thank you!! Thank YOU! I loove making Photo books!